Get into your white light cloak of love and protection and settle down with this ultimate do-it-yourself guide to developing your psychic abilities...everybody's got them, do you know how to help yourself and use them? 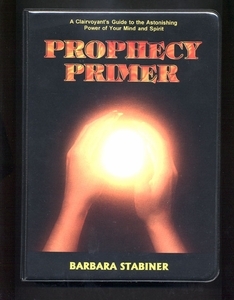 Renowned clairvoyant Barbara Stabiner presents you with stunningly simple methods. This kit is fitted with her easy to read and understand 352 page book, a special audio cassette tape, a 64 card deck of prophecy cards, AND a 50 page supplement giving world predictions. If you've wondered what to ask your spirit guides, how to help your crystals help you - and how to thank them for it, how to interpret your dreams - now you can hop to it! Packaged in a hard protective case. Shipping will be added.